It has been ten years since that horrible day. There are usually a handful of days whose memories we retain throughout our lives--monumental occasions from weddings to births-- yet, not all of these dates are happy ones. So many of us, irregardless of age, can remember with clarity where they were when the news began trickling in. I was on my way to work, stuck in traffic on the Taconic Parkway, listening to a music station. Not knowing what was causing gridlock, I switched stations to news, and heard a reporter's harried breath, relating to the dj the unfurling events down in Manhattan. A plane had hit one of the World Trade Center buildings. I sat there shocked. Just weeks earlier I had accompanied my oldest daughter on a trip to see the musical, Beauty and the Beast, with her piano school. As the bus exited the Holland Tunnel, I excitedly pointed out the Twin Towers to her, still remembering my own school trip there years before. Certain landmarks touch us for one reason or another. The Statue of Liberty is a majestic beacon, the Empire State building has its great views, the theaters lining Broadway promise enchantment inside their doors, and the lights of 42nd Street represent the wonders of the Big Apple. City kids such as myself are able to visit these and other famous places which designate us as New Yorkers throughout our school years. And that morning one of our most treasured landmarks was suddenly and viciously under attack. 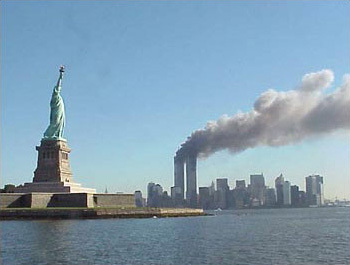 The Twin Towers have been gone now for ten years, but they will live on in our minds and especially in our hearts. May we never forget the ones we lost, the brave ones who sacrificed themselves, the outpouring of help and sentiment from around the world and how we all joined together as one. New York City, Shanksville, PA, Washington, DC. The names of the places may differ but they all define us as one--as Americans. Thank you for this post and for remembering. Yes, all the world is American today. It's a wonderful, wondrous thing, in spite of the tragedy from which it was borne. Thank you StuckInBooks and yes, we agree with you We Heart YA.